The Codex Justiniani, called the 'Digest' or 'Pandects', goes back to 534 when the Emperor Justinian had imperial decisions and enactments compiled as part of his programme to codify Roman law. When law began to be studied in western European universities, starting with Bologna in the 11th century, the 'Pandects' became valued as basic legal texts. The need for huge textbooks like the Codex Justiniani fueled the development of workshops to produce books outside of monasteries. In England, Oxford became a manuscript producing centre, turning out books like this one, which was owned by Merton College. The stretches of blank space on this page result from the special layout which was used for theological and legal textbooks. The main text, here the 'Pandects', was written in two columns in larger writing in the centre of the page, leaving wide margins for glosses (explanatory notes written in the margins or between the lines). Blank space was usually left so that masters and students could add more glosses. 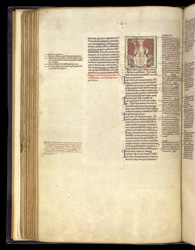 This page has the end of one section and the beginning of another (as indicated by the red writing, a 'rubric'). The new section starts at the top of the second column, leaving more blank space than usual. A portrait of a Roman emperor, portrayed as a medieval king, heads the new section, which begins "Emperor Diocletian."